Place a one-time order or add a subscription. When you love the smooth taste of Dunkin' Donuts® Original Blend coffee, but don't want the extra boost of caffeine, try Dunkin' Decaf®. Made with our unique blend of 100% Arabica beans from Central and South America, Dunkin' Decaf® K-Cup® pods are made especially for your Keurig® K-Cup® brewing system so you can savor the same great quality you have grown to expect from our restaurants in the comfort of your own kitchen or office. Each box contains 12 pods, so pour yourself a cup and experience the taste you know and love. Original Blend Ground Coffee, 1 lb. 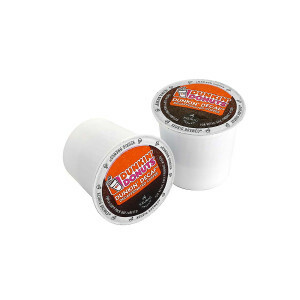 Dunkin' Decaf™ Ground Coffee, 1 lb. Original Blend Whole Bean Coffee, 1 lb. Dark Roast Ground Coffee, 1 lb. Copyright © 2019 All Rights Reserved. Connekt, Inc., is the seller of all Dunkin Donuts merchandise and is solely responsible for all aspects of your purchase.